Let’s face it, nobody needs a national day to enjoy the taco — one of humanity’s single greatest culinary achievements. But, hey, Oct. 4 is National Taco Day, so who are we to disagree? Tacos have been around for hundreds of years, predating the European conquest of America. Though there are more versions than you can count, they all typically involve a corn or flour tortilla rolled around some sort of filling — be it pork, beef, chicken, fish, shrimp or whatever you like. As for the name, nobody really knows where it came from. What we do know is that taco means “awesomely delicious food package” in just about any language. Combine chili powder, cumin, cayenne pepper and salt in a small jar and shake to combine. Set aside. Heat oil in a large cast-iron skillet on medium-high heat. When oil shimmers, sauté half of the chopped onion until translucent and starting to brown, about 3 to 4 minutes. Add ground beef and garlic and cook until browned, about 3 to 4 minutes. Add jar of combined spices and beef broth. Stir to combine. Bring to a simmer and cook until thick, about 2 to 3 minutes. Once the sauce thickens, turn heat down to low to keep meat mixture warm. Combine the reserved chopped onion, chopped tomato and chopped cilantro. Place in small bowl. 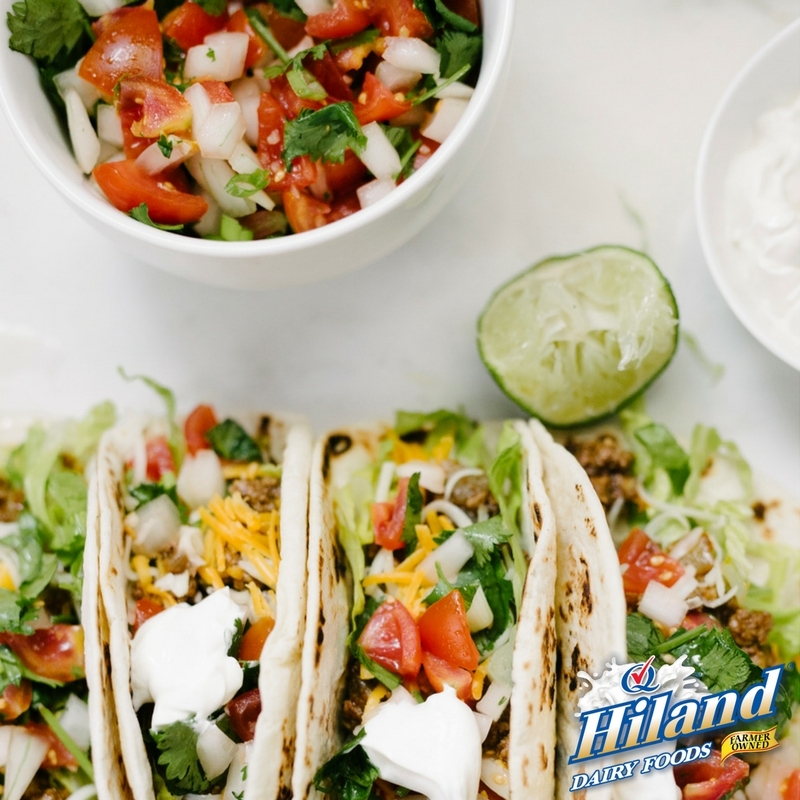 Assemble tacos by placing a small amount of cheese in the center of a tortilla, then add some hot meat/sauce mixture to melt the cheese. Top with onion-tomato-cilantro mixture and a dollop of sour cream. Roll up and enjoy!